CAMBRIDGE, MASS.–Scraped up knees and elbows are tricky places to securely apply a bandage. More often than not, the adhesive will peel away from the skin with just a few bends of the affected joint. Now MIT engineers have come up with a stickier solution, in the form of a thin, lightweight, rubber-like film. The adhesive film can stick to highly deformable regions of the body, such as the knee and elbow, and maintain its hold even after 100 bending cycles. The key to the film's clinginess is a pattern of slits that the researchers have cut into the film, similar to the cuts made in a paper-folding art form known as kirigami. The researchers attached the "kirigami film" to a volunteer's knee and found that each time she bent her knee, the film's slits opened at the center, in the region of the knee with the most pronounced bending, while the slits at the edges remained closed, allowing the film to remain bonded to the skin. The kirigami cuts give the film not only stretch, but also better grip: The cuts that open release tension that would otherwise cause the entire film to peel away from the skin. Ruike Zhao, a postdoc in MIT's Department of Mechanical Engineering, says kirigami-patterned adhesives may enable a whole swath of products, from everyday medical bandages to wearable and soft electronics. "Currently in the soft electronics field, people mostly attach devices to regions with small deformations, but not in areas with large deformations such as joint regions, because they would detach," Ruike says. "I think kirigami film is one solution to this problem commonly found in adhesives and soft electronics." Ruike is the lead author of a paper published online this month in the journal Soft Matter. Her co-authors are graduate students Shaoting Lin and Hyunwoo Yuk, along with Xuanhe Zhao, the Noyce Career Development Professor in MIT's Department of Mechanical Engineering. "Adhesives like these bandages are very commonly used in our daily life, but when you try to attach them to places that encounter large, inhomogenous bending motion, like elbows and knees, they usually detach," Ruike says. "It's a huge problem for the company, which they asked us to solve." 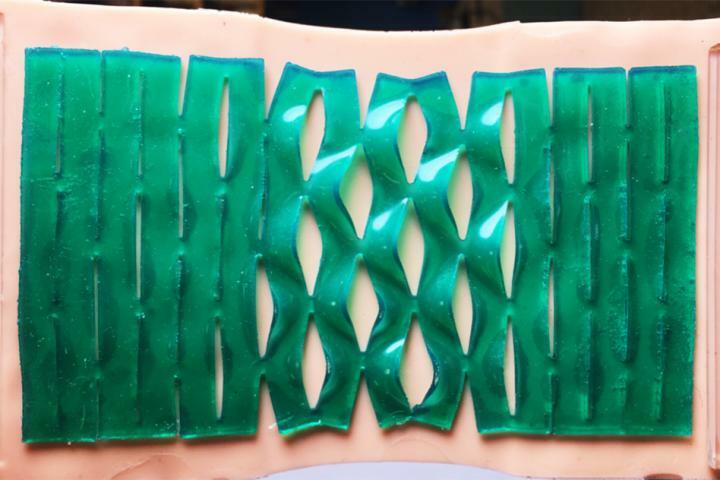 "In most cases, people make cuts in a structure to make it stretchable," Ruike says. "But we are the first group to find, with a systematic mechanism study, that a kirigami design can improve a material's adhesion." Ruike applied a thin adhesive coating, similar to what is applied to bandages, to each film before attaching it to a volunteer's knee. She took note of each film's ability to stick to the knee after repeated bending, compared with an elastomer film that had no kirigami patterns. After just one cycle, the plain, continuous film quickly detached, whereas the kirigami film maintained its hold, even after 100 knee bends. To find out why kirigami cuts enhance a material's adhesive properties, the researchers first bonded a kirigami film to a polymer surface, then subjected the material to stretch tests. They measured the amount of stretch a kirigami film can undergo before peeling away from the polymer surface – a measurement they used to calculate the material's critical "energy-release rate," a quantity to evaluate detaching. Depending on the application, Ruike says researchers can use the team's findings as a design blueprint to identify the best pattern of cuts and the optimal balance of the three parameters, for a given application. "These three parameters will help guide the design of soft, advanced materials," Ruike says. "You can always design other patterns, just like folk art. There are so many solutions that we can think of. Just follow the mechanical guidance for an optimized design, and you can achieve a lot of things." "They make this pain-relieving pad that's pretty popular in China – even my parents use it," Ruike says. "So it's super exciting." "The current films are purely elastomers," Ruike says. "We want to change the film material to gels, which can directly diffuse medicine into the skin. That's our next step."